← In which some folk had a sneak peek at my new play and I write a press release about it. 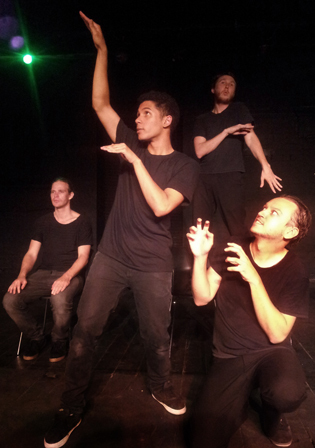 I wrote Get Kraken as part of ASSITEJ SA and The Theatre Arts Admin Collective’s Inspiring a Generation programme, a combination of a mentorship and cultural exchange which I have posted about a couple of times before (Inspiring a Generation, No Really). It’s being performed at various schools around the Cape even gone as far a field as the Garden Route Family Festival in Plett and Knysna. Right now we have one week left at the Intimate Theatre (16th April – 4th May), and it’ll be heading to the National Arts Festival in Grahamstown in June / July as part of the ASSITEJ family venue. What sets the play apart from most other family fare is the way Kim Kerfoot and the performers create the world of the story. It’s done in the style of a theatrical comic book without props, set, or costume – the actors, dressed in black t-shirts and pants, use their bodies and voices to zoom in and out, to create special effects and locations from a busy road, the ocean by night, to a submarine or the inside of a whale. Part of going to schools has been giving workshops on this energetic style of performance. The script is also going to form part Shuter & Shooter’s grade 9 English reader next year, an added bonus for schools. This entry was posted in Projects and tagged ASSITEJ, Dylan Esbach, Get Kraken, Intimate Theatre, Jason Potgieter, Jon Keevy, Kim Kerfoot, Shaun Acker, Shuter and Shooter, Stefan Erasmus, TAAC. Bookmark the permalink.